Welcome to another blog post that is shamelessly flaunting the awesomeness that IS the new Stamp of Approval Collection from Catherine Pooler! You can now purchase the release here. Today's card has a fun and vintage/shabby chic feel to it, and I incorporated one of my favorite techniques--watercoloring! Did you know that the Catherine Pooler inks are awesome for watercoloring? Once you stop you won't be able to stop so consider this your enabler warning! In order to do a watercolor wash, you'll just need to pounce some ink on to a slick surface (I used an acrylic block). You can use a water brush or a paintbrush and get the same result with either. Cut and score a 4.25 in x 5.5 in. card base and set it aside. You'll also want to trim down a piece of watercolor paper to 4 in. x 5.25 in. Take your water brush or paintbrush and apply clean water to the paper. Next, just take your water brush or paint brush to your slick surface and then drop in the color on to your wet watercolor panel. Move the color around, add more water, or add more color until you achieve your desired affect. 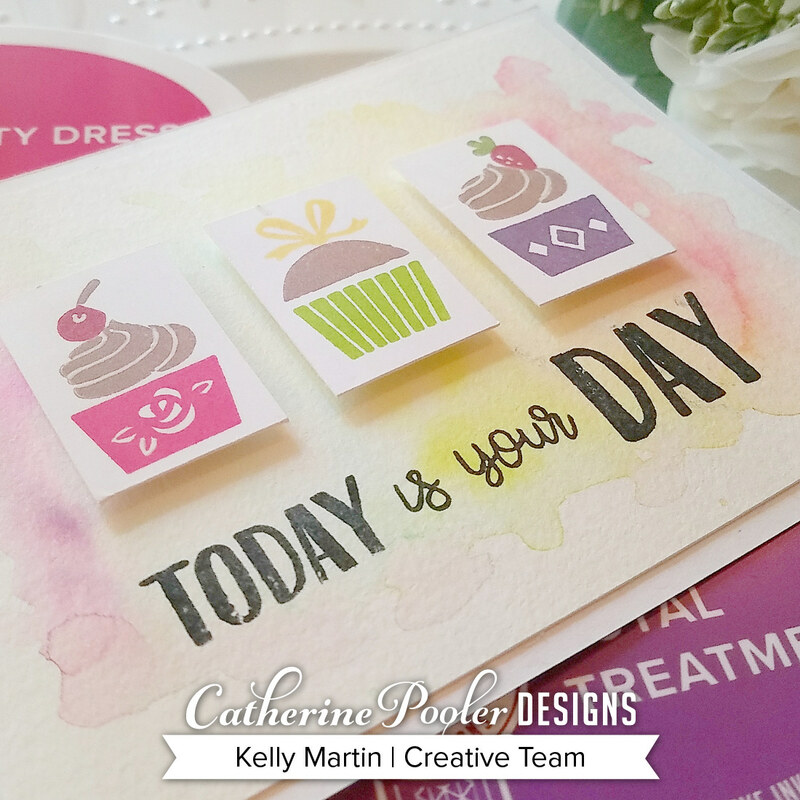 Stamp some images from the I Eat Cake stamp set on to your white Catherine Pooler Designs cardstock (The CP inks stamp like a dream on this cardstock!). Trim down those pieces until they are small enough to fit all across the cardstock panel. I mounted mine with foam tape to have them pop off the card panel, but you don't have to. Choose a sentiment to stamp and then adhere your watercolor card panel on to the cut and scored card base that you created earlier. Now, step back and try not to eat the card you've just created because....for real....these cake images are just a little too realistic for my own comfort level. I'm gonna be suggesting scratch and sniff inks to Catherine soon, so you just push the save button on that thought and maybe it will become a reality. Edible cards can surely be a thing, am I right?! 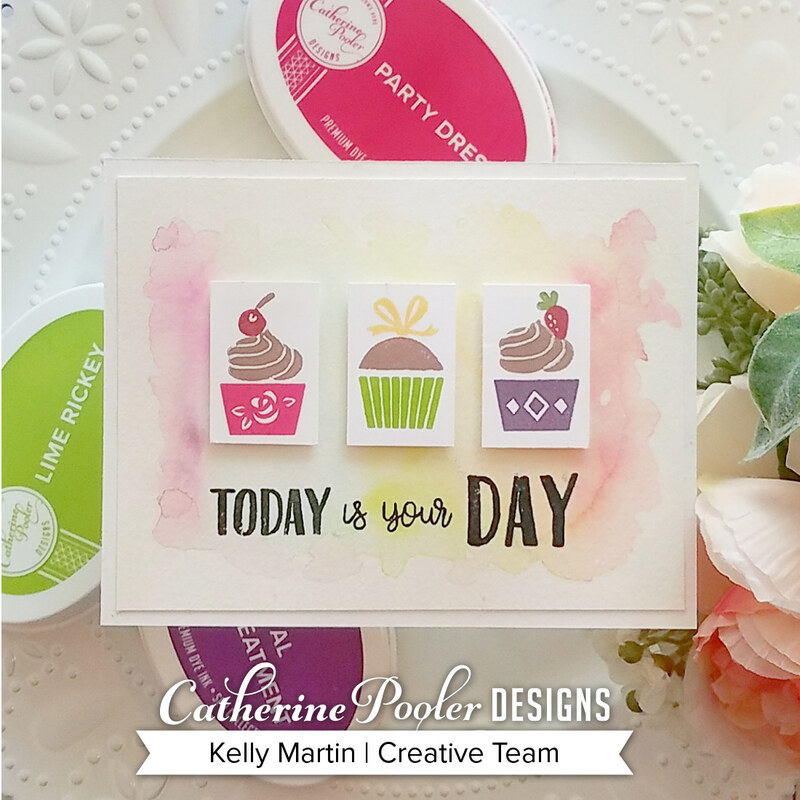 Stamp of Approval Blog Hop + Giveaway! I Just Love Your Face!